In case you missed me last night, here is the link to yesterday’s Journal Jabber Show. There was a four minutes blackout, due to a storm. During that time, I was transported to a parallel universe. I lived there for three thousand years without aging a bit. I wrote fourteen different series of twenty three books each. All of them bestsellers. I learned one hundred and fifteen different languages and became proficient in fifty-eight of them. I invented ten languages. One was accepted as a common koine and taught in schools. Kids all around the world hated me with a passion. And it was okay. In the meantime I let my hair grow until I had a train eight meters long. Two maids followed me everywhere and took care of my hair. After four hundred years, I decided I didn’t need to eat anymore and stopped. It improved my skin and my productivity. I also stopped sleeping. I learned how to play the piano, but didn’t enjoy it that much and switched to viola, violin, harpsichord, and clarinet. Finally, I admitted that music wasn’t my cup of tea and pursued a career as a ventriloquist. Given all the free time I had, it wasn’t difficult to master the art. To avoid getting easily bored, I also studied medicine and cured several diseases. Collected a dozen of Nobel prizes. Among them, one for finding the cure for a virus which was also my creation. Nobody is perfect, but I almost succeeded. Then, I was sucked back here and finished the interview without missing a beat. While I was there, Klingon was added to bing translator. You’re welcome. 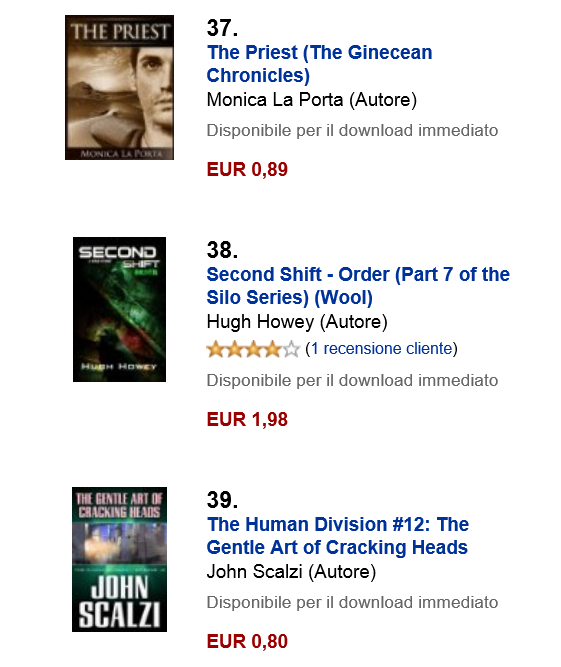 Sharing space with two authors I admire on Amazon.it. Life is awesome! In the process of posting my Friday Snippet, I got sidetracked. 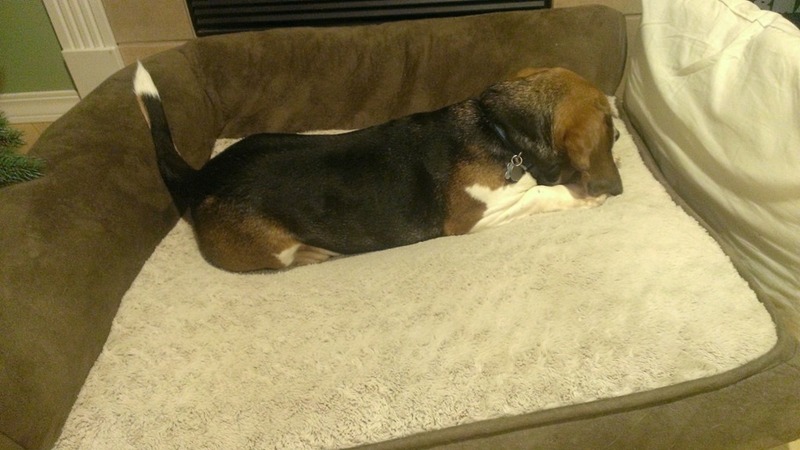 Not that it takes me great effort achieving distraction… it isn’t a coincidence my furry baby is a beagle. 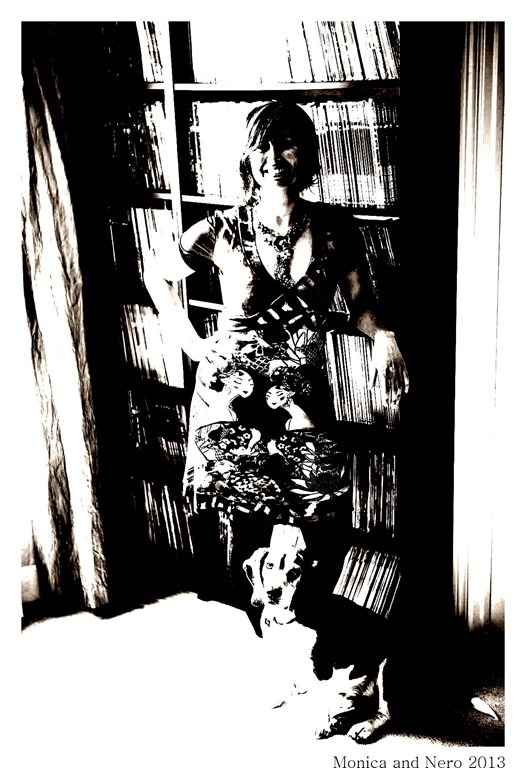 Anyway, looking for a pic to accompany my latest excerpt, I remembered just recently I asked my dear hubbie to shoot some pics of me and Nero. Applied some Paint.NET to the original and then I thought about an apt title. I think I nailed it. *Behind me, there’s part of Roberto’s and mine comic collection. Some of the magazines are still wrapped in their original bags. We collected double issues of the X-Men until we we got married, then we decided our relationship was serious enough to switch to one subscription. That’s love and commitment for you. And again. And again. 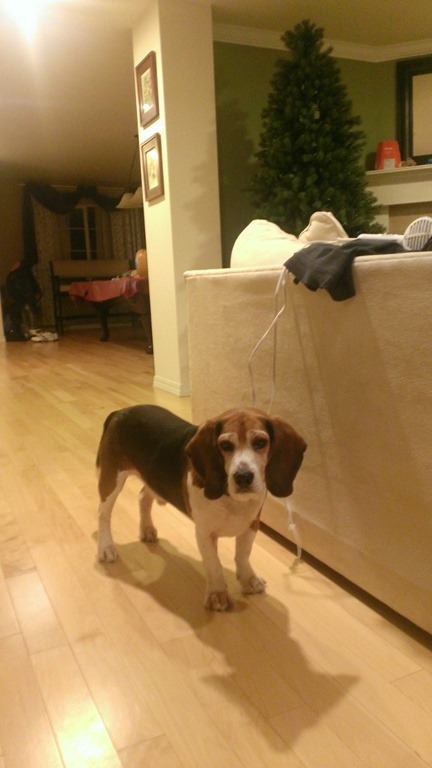 People who own beagles know how single-minded beagles can be when it comes to food. I’m sure that Nero could learn a language or two if his meals depended on that. My furry kid is aging and slumbers by my side most of the day, but his appetite hasn’t decreased. 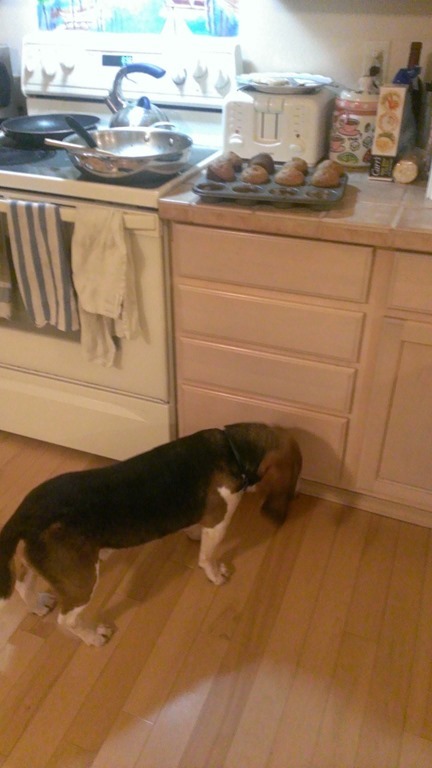 Sometimes, the door leading to the pantry is left open—by terrible mistake—and his nose knows it almost right away. You can see him sneakily approaching the kitchen to reach the pantry and violate the garbage can. He dives inside of it, head first. Gruesome sight. Recently, due to the fact that he has gained some weight—and the afternoon walk doesn’t seem to help him losing it—we had to put him on a diet: same quantity of kibbles, but less calories. Much like a recovering addict, he has been on a food rampage ever since. 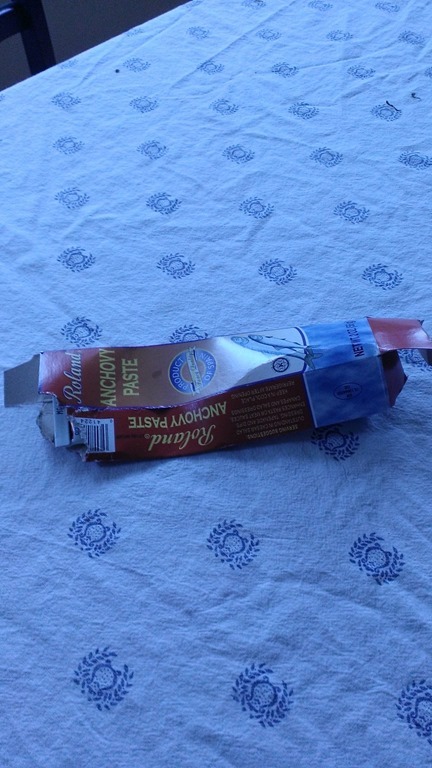 Only in the last two days, Nero has started sniffing Ebelskiver Mix and cracked open a tube of anchovy paste. 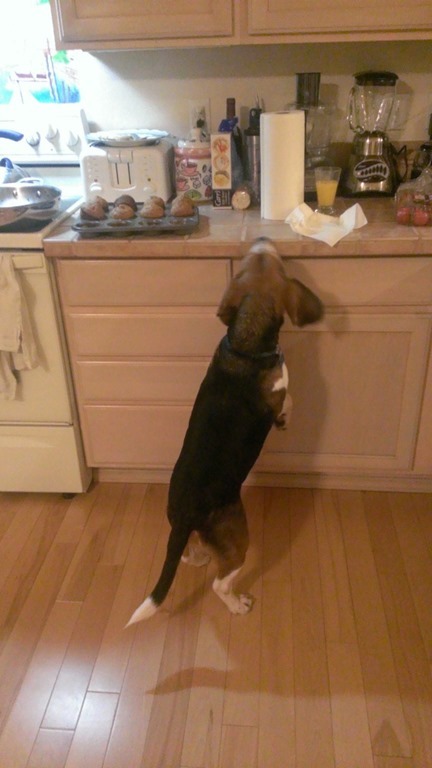 Today, displaying a physique I didn’t think he had anymore, he jumped at kitchen counter level and snatched a banana bread muffin cooling in its tray, without displacing the tray. 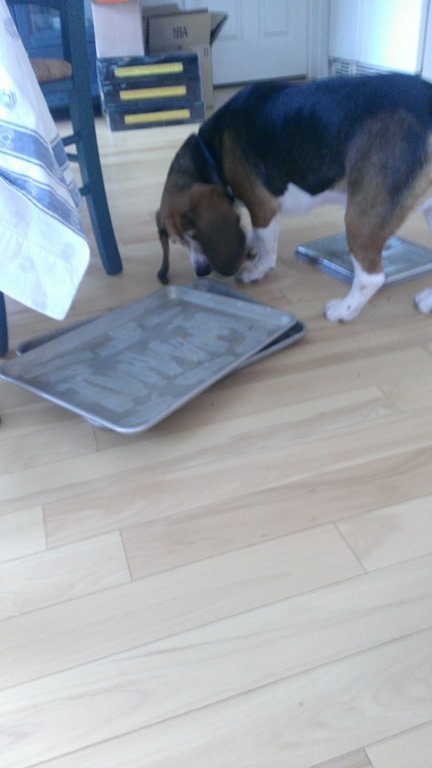 Later, eyeing a pile of pizza pans on the table, he dragged the table cloth to land the pans on the floor where he could lick the crumbles of whatever we had baked on them. Where was I? Either in the bathroom, reading a book or upstairs in my studio, trying to write one. Don’t judge me. 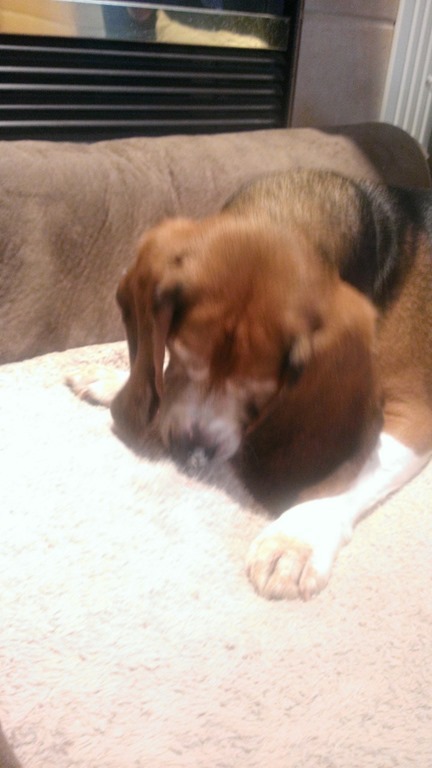 I found him sniffing lines of white powder. Finished the effect of the Ebelskiver Mix, Nero went for something stronger. 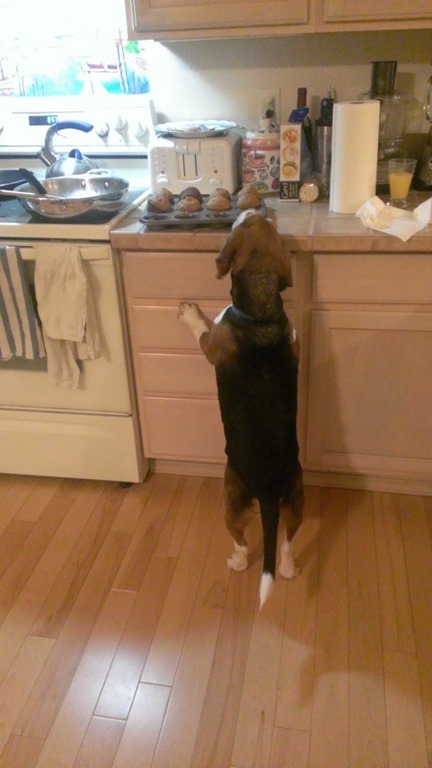 After he had already devoured one muffin, he was on the prowl for the whole tray. Are you looking at me? Are you looking at me? He seems to say. 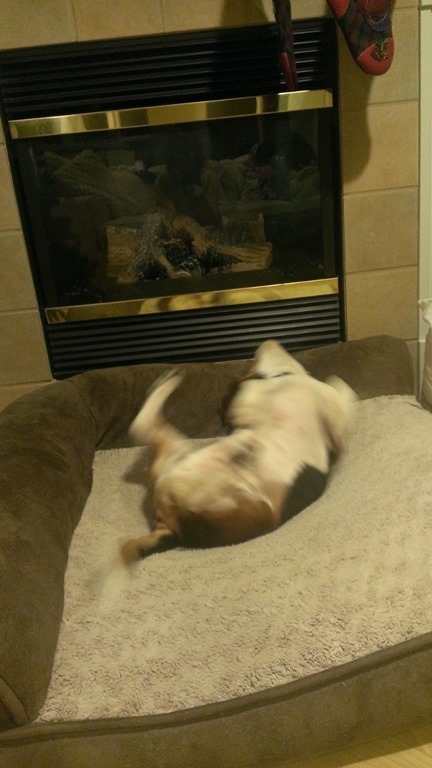 But, as you can see, he’s in very good shape right now. But, wait! He isn’t done yet. On January the 6th, during the early and cold hours of the night, an old Italian lady flies on her broom over the Italian landscape and delivers goodies and the occasional piece of coal. 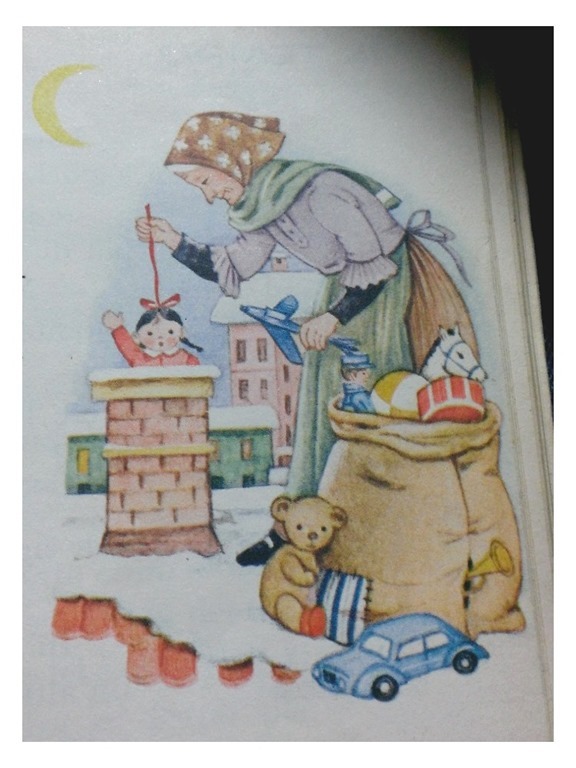 The night before, kids write letters asking the Befana to bring them nice toys, and to ingratiate her they also leave cookies and milk by the empty stockings. Nowadays, she is getting mellow and doesn’t leave real coals anymore. I do remember the real deal. It was a nasty affair. My kids are older, but I still love to celebrate this Italian holiday with them. Filling the stockings with their favorite sweets— Duplo bars, Happy Hippo, and the classic Kinder bars—and the chocolate coins—we found the euros version—and small gifts brings me back to the time when I was on the receiving end of the Befana. I liked her way better than Santa Claus, because on the Epiphany everybody living in or nearby Rome went to Piazza Navona to see the Befana’s market. Hundreds of street vendors selling cheap toys and mouth-watering sweets. The aroma of cotton candy and roasted chestnuts still reminds me of the sixth of January. 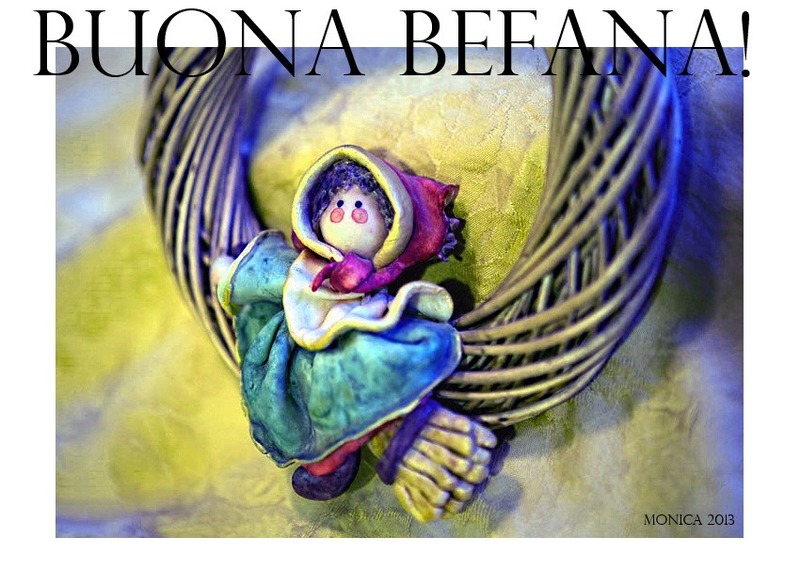 One day late, but Buona Befana, everybody! * A small Befana garland I made before I moved to the States. One Christmas, I had lots of fun modeling Santa Clauses, Nativities, and Befane with cold porcelain. I even decorated the Christmas tree with cold porcelain decorations. **An image I took from my first grade’s Italian reading book. It was called “Semi” (seeds) by Rossella Balzi Monti, Janus publishing house. Wherever you are, Miss Rossella, know that I loved your books and they have a special place in my heart. I didl. Do you didl? If you don’t, you should. 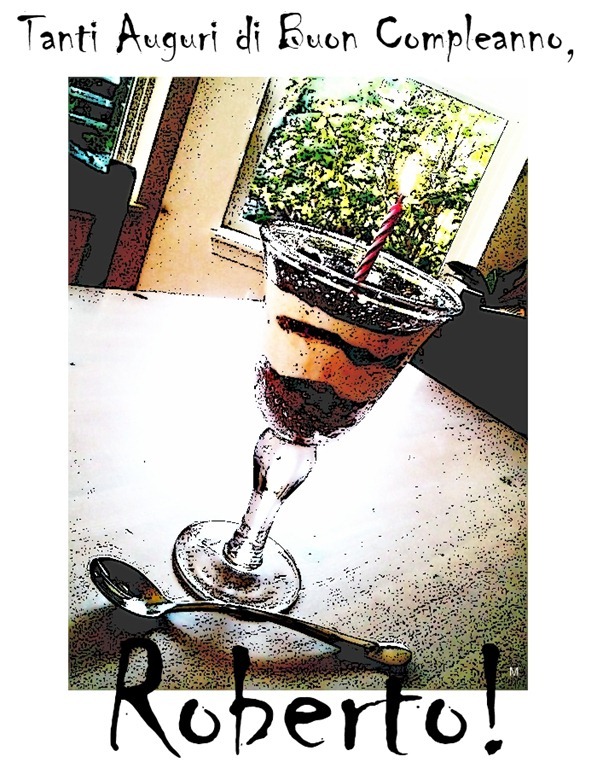 My husband showed me this fun app, didlr, a few days ago and I got hooked right away. Didlr is easy to use and it has a social aspect to it that makes it even more fun. I’ve been playing with it on several devices and the one I prefer to work with is my Windows Phone. Although didlr on Windows Phone has less functions than on the Surface and iPad, I’ve created several didls on it and I’m quite happy with the results. Didlr’s palette is bright and there’s this functionality to make the colors see-through which adds a lot to the experience. Once you publish your freshly-made didl, it goes on the didl stream where didlers can vote for it if they so fancy. You can also follow and be followed by other didlr’s enthusiasts, and even answer to their didls with one of yours. Just one glance at the didl stream and you’ll be amazed by the sheer talent out there. And lastly, probably the cooler feature is that didlr replays step by step all the actions you took to create your priceless work of art. Below are some of my didls. One of them cost me a peach cobbler. 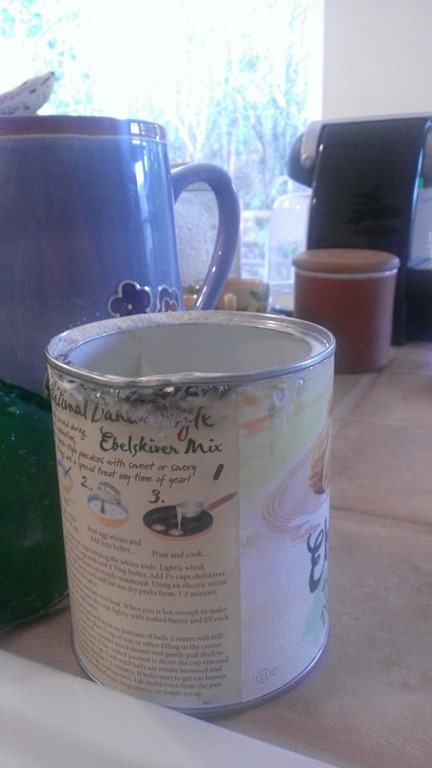 I was having too much fun drawing and the cobbler suffered irremediable damages. Nobody ate it, but I showed the friends who had invited us for dinner—and who were expecting the cobbler—my masterpiece. 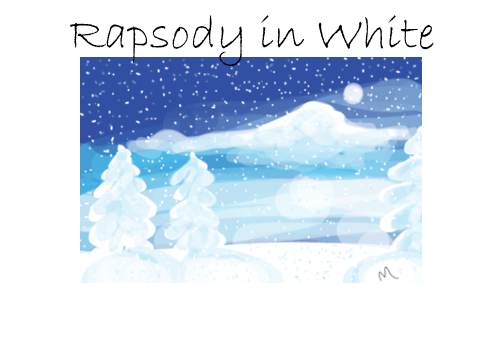 Rhapsody in White (which I created on my Surface and I realize now, I also misspelled) received mixed reviews. The Muse is a cruel mistress… By the way, I didl as momilp. See you there!